The Association for Computing Machinery’s Special Interest Group on Computer Graphics and Interactive Techniques (ACM SIGGRAPH) is pleased to announce Ramesh Raskar, PhD, Associate Professor and Head of the Camera Culture group at the MIT Media Lab, as the 2017 recipient of the Computer Graphics Achievement Award. The Computer Graphics Achievement award is given each year to recognize an individual for outstanding achievement in computer graphics and interactive techniques. Established in 1983 and given to one individual annually, the Computer Graphics Achievement Award is a prestigious distinction, and one of the highest honors in the field of computer graphics. Selected as this year’s recipient in recognition of his numerous, impactful research contributions in computational imaging and light transport, Ramesh has advanced the field in a wide variety of areas, including femto-photography, light-field displays, and augmented reality. In addition to making significant strides in computational imaging, Ramesh and his colleagues have developed compassionate applications for cutting-edge imaging technology. 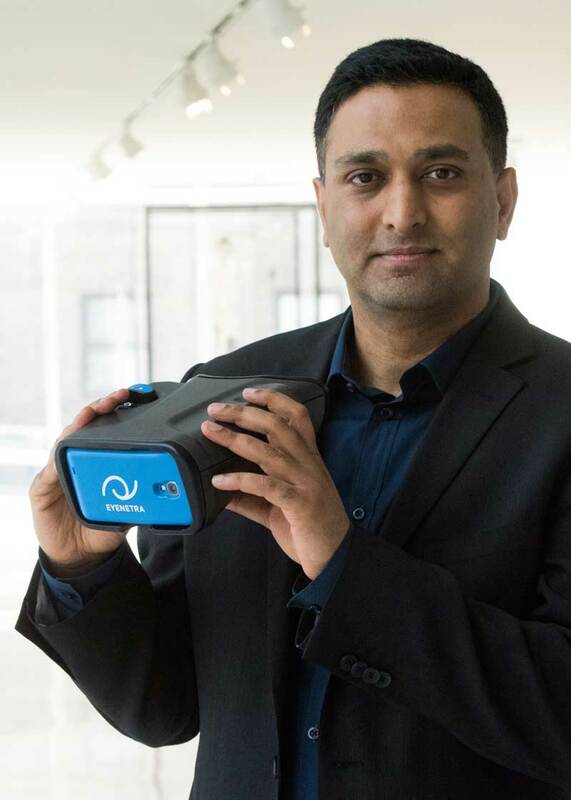 In 2015, Ramesh co-invented a device to address a serious health problem affecting hundreds of millions of people worldwide: uncorrected refractive errors, which is the second-highest cause of blindness. The device, called EyeNetra, uses mobile light field display on phones as a low-cost technique to measure human refractive error and prescribe eyeglasses. EyeNetra was first conceived for use in poor and remote regions of Africa and Asia, where basic health care is difficult to access. India alone has roughly 300 million people in need of eyeglasses. Since its release, EyeNetra devices have been used to diagnose and treat more than 130,000 people in 80 countries. The same year EyeNetra was released, Ramesh’s group unveiled EyeSelfie, an inexpensive hand-held device able to photograph the back of the eye. Images of the eye’s interior can help physicians detect vision-threatening diseases such as glaucoma, macular degeneration, and diabetic retinopathy. Ramesh and colleagues also developed an approach to capture the movement of light in extreme slow motion as it travels through participating media. This method, called “femto-photography,” allows us to actually see light move. The technique uses femtosecond-speed (one quadrillionth of a second) lasers and streak cameras to observe a slice of visual information at a particular instant in time; repeated sampling is then used to assemble an entire video. The same technique can be used to see around corners by assembling images from very short bursts of light that is inter-reflected back to a sensor. Ramesh continues to work with this technique with scientists in the Camera Culture group, allowing us to see through fog, see through tissue, and even read through the pages of a book without opening the cover. Ramesh has made notable contributions in a number of other areas, including projector-based augmented reality, non-photorealistic rendering, motion deblurring, and visual markers for augmented reality. He also initiated a session on “SIGGRAPH Next” at ACM SIGGRAPH 2015 to foster high-level graphics innovation. Currently an Associate Professor at the MIT Media Lab and Head of the lab’s Camera Culture group, Ramesh is also conducting special projects at Facebook. He received his PhD from UNC, Chapel Hill in 2002, and conducted research at the Mitsubishi Electric Research Lab until 2008 when he joined MIT.